A type of sea squirt called ciona intestinalis, which is Latin for "pillar of intestines," covers the side of a lobster trap last month at the Ellsworth public landing on the Union River. The species is one of multiple sea squirt varieties that have blossomed along the Maine coast in recent years. 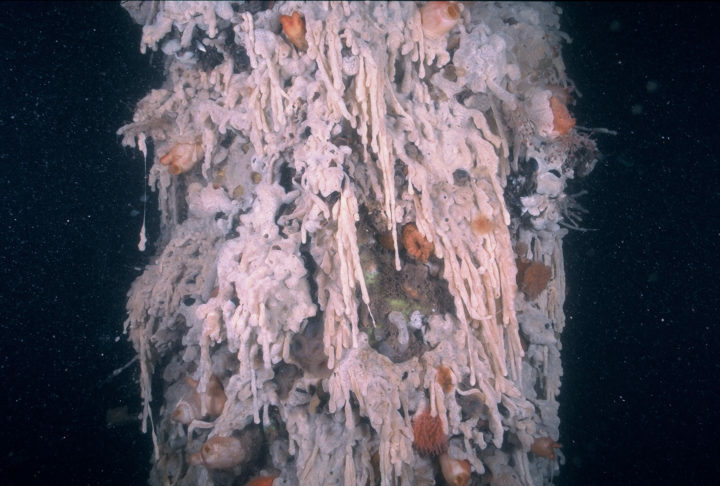 A type of sea squirt called didemnum vexillum cover a piling on a pier at Estes Head in Eastport in this undated photo. The species is one of multiple varieties of sea squirts that have blossomed along the Maine coast in recent years. Add sea squirts — a variety of small, tube-like marine creatures that live bunched together in colonies — to the list of species that seem to be thriving in the warming waters off the Maine coast. Marine scientists say that the gelatinous animals have been growing in number in shallow waters along the coast and could be creating problems for native organisms that are getting squeezed out of their traditional habitat on the bottom. Red Asian seaweed, mola mola, green crabs and black sea bass are among other unfamiliar marine species that have been showing up in greater numbers in the Gulf of Maine in recent years, either because the waters have been warming, they’ve been artificially introduced or both. Harris, who has a study site at a pier at Estes head in Eastport, said one species especially, called didemnum vexillum, has proliferated in recent years. He said the species looks “like pancake batter,” and the creatures have enveloped some of the structures where he dives to collect data. 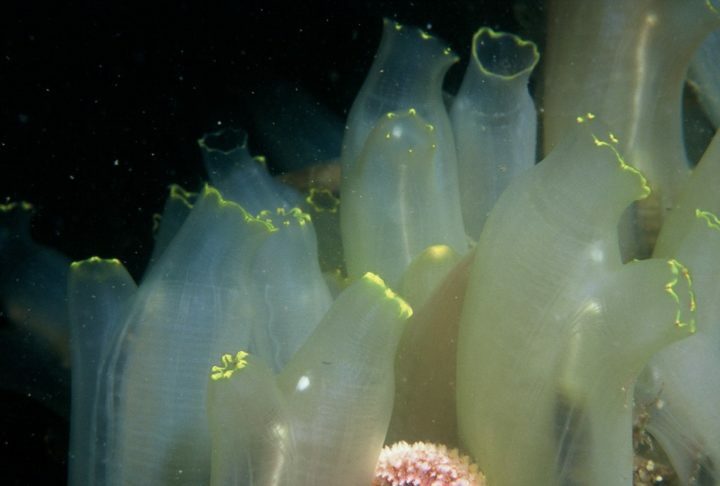 Sea squirts, also known as tunicates, are mobile for their first few days of life but then attach themselves to pilings, rocks, seaweed or anything else fixed in place — including lobster traps left too long on the bottom. They siphon water through their bodies as they extract nutrients from the water and often grow in bunches. The different kinds of sea squirts number in the hundreds or more and can be found around the globe, but some seem to have migrated to Maine from overseas. Several of them have flourished in the Damariscotta River, where many oyster farmers set cages to grow the bivalve mollusks. Harris said sea squirts especially can be a nuisance for aquaculture growers who keep nets or cages underwater for extended periods of time. Oyster farmers on the Damariscotta River, for example, have to be careful not to let their gear get overrun. “If they overgrow the nets, they smother the oysters inside the nets,” he said. Kevin Eckelbarger, former director of University of Maine’s Darling Marine Center in South Bristol, said sea squirts were not prevalent in the river in the early 1990s. Since the early 2000s, however, they have come to dominate much of the river bottom and in more recent years have become “far worse,” he said. A type called ciona intestinalis — “pillar of intestines” in Latin — was especially pervasive but now the didemnum variety seems to be the most plentiful, Eckelbarger said. Ciona still can be found in many places along the Maine coast. Larry Harris | University of New Hampshire. A type of sea squirt called ciona intestinalis -- Latin for "pillar of intestines" -- grows at a study site at Estes Head in Eastport in this undated photo. The species is one of multiple varieties of sea squirts that have blossomed along the Maine coast in recent years. 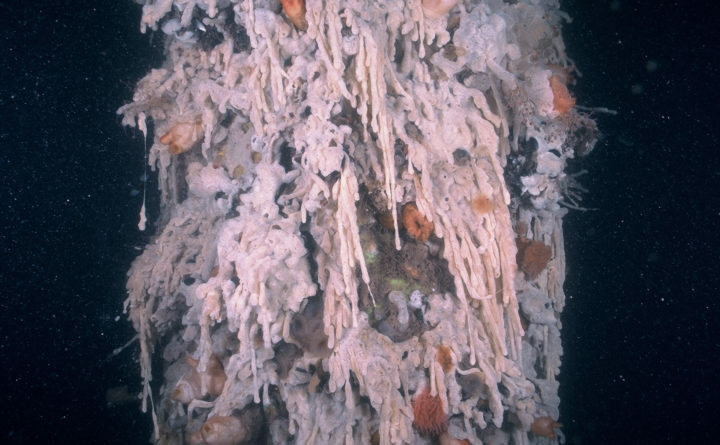 Eckelbarger added that, though some tunicates technically are considered invasive species, many have been in Maine for 100 years or more, having migrated across the ocean on ships. Rhian Waller, an associate professor at Darling Marine Center, said that warming water in the gulf has helped promote the expansion of sea squirts, which are known to reproduce and grow relatively quickly. According to Harris, there are ways to deal with sea squirt blooms — as long as they are on an object that can be removed from the water. If they dry out, they die, but they also “really don’t like fresh water,” he said. 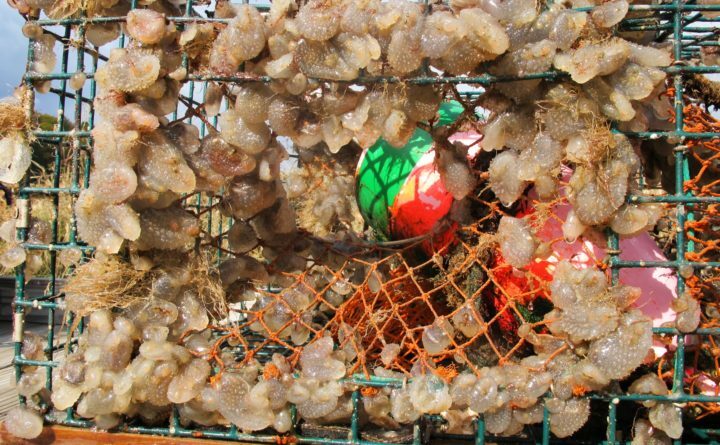 Leaving lobster traps or oyster cages out in the rain will kill any sea squirts on them. As for trying to limit their numbers below the surface, Harris said he’s not sure what can be done. Crabs and urchins do feed on them but not enough to halt their spread. “Once they’re well established like this, there’s nothing you can do about it,” he said.